A few months ago, I try to make design for my online store. At that moment, Mariah Carey is booming with her big concert Angel Advocate. I think, people wanna have something memorable to memorize her concert. So, I decide to make cover Mariah Carey Angel Advocate and make it to be line art vector. I start to search my file and not for a long time I found that image. After 2 hours manually tracing into line art vector. Finally I've done it. The beautiful Mariah Carey is done in line art vector. I feel so happy and then not wasting time again, I post it in my online store. Two days later I open my online store and I'm shock! Why I'm shock? 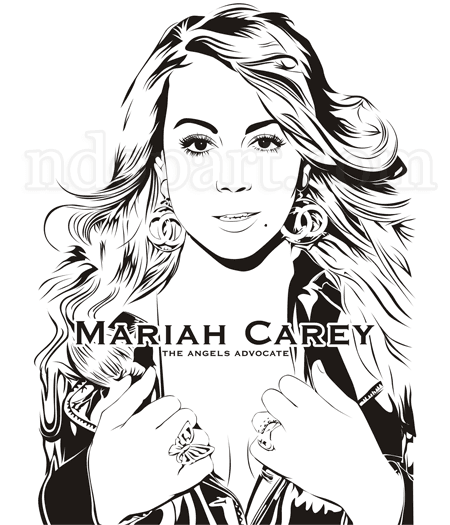 Just because my line art vector Mariah Carey The Angel Advocate is gone! I don't how can be like that. And then I go to my account and my vector is still there. Then I thing, maybe it because of copy right. So, I delete my vector on my account and try to sell here in my vector blog. I don't understand, I just redraw and make it totally different and I'm not just pick and sell it, and you know all the picture that I download is free form Mariahdaily.com. But never mind, I'm OK.
OK, as usual, I'm not gonna sell it in high price, you just spent your paypal $15 to get that vector. Just email me at ndop@dzofar.com, so I can send the corel draw, Ai or eps file for you. Thank you for coming to my blog, this blog is very immature, I'm still learning how to write English perfectly.. This is far away from flawless..